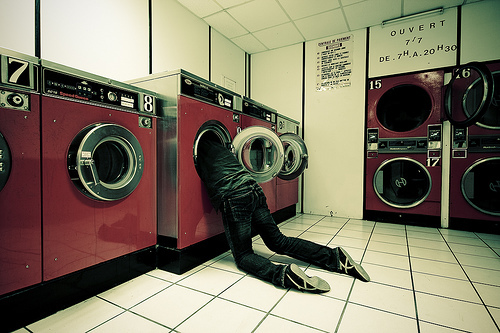 Everything Changes – The Guide to Young Adult Cancer » Is it Hard Asking for Help? Is it Hard Asking for Help? I spent my first month of cancer trying to weasel my way onto COBRA. (Check out the podcast from my interview on yesterday’s Fresh Air with Terry Gross, where I talk about this and other young adult cancer issues.) One of my tactics was pulling the cancer card with COBRA phone representatives: “I’m 27, I have cancer and no insurance, pity me.” It was life or death and I was shameless. Pulling the cancer card so early on in my diagnosis initiated me into the world of asking for help from others. And I got pretty good at it. But, most other patients I interviewed in Everything Changes told me that asking for help crushed their pride and amplified their lack of independence. Listening to these other patients, I started feeling guilty over not feeling shameful about asking for help. Had I spent my whole life as a louse in disguise? Was cancer the ultimate chance for me to be waited on while I ate bon-bons? Hardly. When I was diagnosed I lived in an isolated studio apartment in a rough neighborhood with no amenities. My laundry was down three steep flights of stairs in a garage that looked like a crime scene from Law and Order. There were no quick trips to the grocery store, no roommates, partner, or next door neighbor asking to pick up prescriptions for me. The only way I could get my needs met was by asking people to go out of their way to help me. There was a familiarity to it all: I had spent my childhood watching my grandmothers shuttle chicken soup across town to whoever was in need. My second radiation treatment was the height of my helplessness. I was so weak I asked a guy friend to walk me to the bathroom. He had to prop me up on the toilet as I peed. While my extreme illness sucked, there was a small benefit to being humbled in this way: it reminded me that I’m human and I cannot make it alone. What is it like for you to ask for help from others? Have you ever refused to ask when you really needed it? How do you handle it when people cop out, say no, or don’t show? 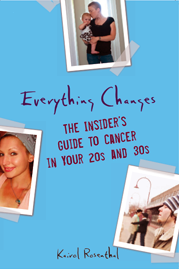 For practical resources on how to build and manage a your support system, check out Everything Changes: The Insider’s Guide to Cancer in Your 20s and 30s. Asking for help was one of the hardest things for me when I was in treatment. You see, I have spent most of my career in case management of one kind or another meaning I am the one who helps others. One of the weirdest experiences with cancer, at least for me was that other than the chemo side effects I felt pretty good. Don’t get me wrong, the side effects were pretty awful but I had chemo every three weeks so there was usually a week or so a month that I felt okay. I found Lotsa Helping Hands to be a godsend. I filled out the things I needed help with and friends, colleagues and neighbors were able to fill in how they were able to help. It cut out the face to face requests and let people choose how they helped. Keep up the great work, I missed you on Fresh Air because of a rehearsal but I’m gonna podcast you later. As the spouse of someone (a young adult) with ESRD, I find it difficult to be in a position where you feel like the need for help is constant. When I say help, I’m not necessarily referring to major things — just occasional favors here and there. I think with a chronic illness, there are certain limitations that do not go away because there is no true “recovery” point. As the one without the chronic illness, I get frustrated about not be able to do it all myself and I have a difficult time asking for help because then I feel like a burden. Sometimes I wish people would offer to help rather than me having to ask. I may have unrealistic expectations in that regard, but it’s the way I feel sometimes. Now, I’m so desperate I’ve had to use people, even complete strangers and it was/is extremely difficult for me to ask/accept this help. It also seems people want to help alot at first, but once you use them once/twice, and maybe it’s just my guilty conscience perceiving it this way, but I feel like they feel, they did their part, made their contribution and feel good that they helped, and then you might not hear them offer as much. I think people dont realize that depending on the case, the help is ongoing thing, not just a one time visit. of course i’ve become a good planner and try to stack up errands/drs on the same days, etc…and been creative in how i rotate people, but there’s only so much you can do. it’s really crazy hard doing this without alot of help. and i’m at the point where i might not be able to have certain things i need or get to certain doctors because of it. This may relate my mom was a very independent woman and asking for help was very hard for her. I was able to help whether she wanted it or not at first she didn’t really need me or want me. Then as time went on, she realized she did need help and I was ready, willing, and able to do what I could do to help her. I have a terrible time asking for help. When I was first diagnosed 8 years ago, there really wasn’t much of anything available whether I wanted it or not. Now, I’m just learning that it’s okay to be weak and need something from somebody else. It’s hard though. I still feel like I have to prove myself to some extent and it’s been hard to learn that I don’t always have to go at it alone. Interesting thoughts on the case management stuff. For me I think it was weird at first, from a personality or identity perspective. Going from being someone people come to with their problems, and being able to support others, to the one people are afraid to talk to and don’t want to say anything to, cause as many people would tell me when I tried to ask about them, “my problems are nothing compared to yours”. So that’s what was weird for me, not being able to give the support/help to others anymore and having people be afraid to share anything with me. On the plus side, the case management experience helped with knowing that there are “resources” out there and navigating the social services world. Being out of work, people often ask how I spend my days and i’d always reply, “mostly, case managing for myself”. Between resources/insurance etc, it really is like a job. I didnt mind looking for whatever resources I qualified for and figured I’d take advantage of it if it was out there. The help from agencies I’m ok with. Maybe it’s cause theyre more like “strangers” or because you know they’re there to help. It’s more the asking of individual people/friends that’s still really hard cause you feel like youre putting them out, ha, or know you are even if they won’t fully admit it to you. Like many other people, I am a very giving person but I am horrible at asking for help. But for me, it depends largely on who I am dealing with. I don’t have to ask for much help now that my health is more or less stablized(touch wood), but in my sickest days, I was lucky as I had a few friends, who, without my asking, would call me to check if I needed anything from grocery stores because they are going anyway (I always jumped on the opportunity), or those who would call me to say they are dropping food for me because they already cooked something, etc., Those people did not make me feel like I was a burden to them. One bad experience was when I asked a friend of mine to pick up ready-made food for me from a deli where the food was not too familiar to her. She really freaked out (‘you need to call them and tell them exactly what you want so that I can do this right – actually you need to come with me”). I never asked her to do anything again, although she always and still offers. Some people get really nervous or overwhelmed when we ask for help, and I never understood why (maybe they did not mean it when they offered help?). But, this issue of “asking for help” gets to the core of my conflicts of whether I want to look strong and heroic to people, or I want to be understood and supported where I feel most vulnerable and hurts. I still haven’t made up my mind. . . .
Definitely ask for help. People around you want to help you – they just don’t always know what to do – really don’t be afraid to ask – even a caregiver should ask – it’s a big job caring for someone with cancer and a caregiver needs help too . . just everyone keep asking until you find someone who is truly willing, I hate the idea of anyone not asking for help through this. . . I caught your interview on Fresh Air. Thank you. As the husband of someone who recently died after a long bout with cancer, one of the greatest gifts I received was my wife’s willingness to ask and receive help. One of the hardest things she faced in the process was to surrender to that help.